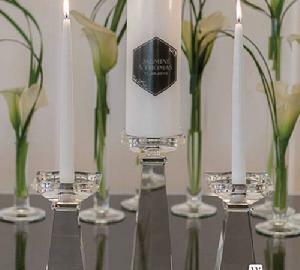 These exquisite crystal holders are designed to accommodate both pillar and taper candles. Will add an elegant flair to your Unity Candle Ceremony as well as throughout your tabletop displays at your reception and later in your home. A versatile accessory with timeless appeal. Candles sold separately. 9616 - Tall Dual Purpose Crystal Candle Holder. W 9 x L 9 x H 21 cm. 9615 - Low Dual Purpose Crystal Candle Holder. W 9 x L 9 x H 16 cm.